Do you like video poker but want to up your game a little? In this game you can combine the joy of playing poker with the thrill of going for a jackpot! 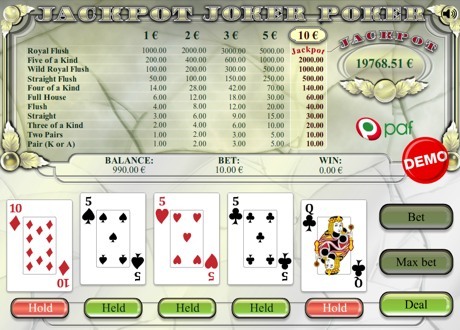 The highest win in Jackpot Joker Poker is based on a progressive jackpot that starts at 10,000 euros. Your objective is to obtain the best poker hand possible. The game is played with a deck of 52 cards plus the Joker, 53 cards in total. The available bet levels are 1.00, 2.00, 3.00, 5.00 and 10.00 euros. The winnings vary depending on the bet level. The jackpot is only available at the highest bet level - 10 euros! Select your bet by clicking BET. To play with the maximum bet, click MAX BET. Click DEAL to deal the initial hand. Your first hand of 5 cards is dealt and you can thereafter hold one or more cards. Click HOLD under the card(s) you wish to hold. You can hold from zero to five cards. If your initial hand already is a winning hand, the cards are held automatically. Click DEAL to discard those cards you choose not to hold. If you win, you have the chance to double your winnings in Double or Nothing game. When you win you can either click COLLECT your winnings or try to DOUBLE up. In Double or Nothing you have a 50-50 chance of doubling your winnings or losing them. If you want to take the challenge, click “Double”. Your previous winnings will automatically change into your bet for the new game.